Think of it this way, if your spine has shifted out of its normal position, it’s no different than your car being out of alignment or the foundation of your house sinking. If there is a structural issue you can look to patch up the secondary issues (cracking drywall or the roof of the house), or we can look to correct the root cause (foundation). For example, when your neck has a shifted, it’s going to put extra stress on the muscles, ligaments, tendons, bones, and discs in that area. 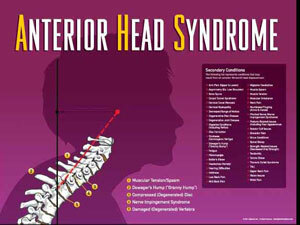 This is often evident when someone has poor posture. The spine will shift from it’s normal position and become “locked” there when viewed on the video x-ray. This is what we refer to as a subluxation in chiropractic because the nerve signals from the brain cannot properly communicate with the body.